Direction by Samuel G. Roberson, Jr. The thrilling, final collaboration by the creators of Cabaret and Chicago, The Scottsboro Boys has been hailed as one of the most visionary and controversial musicals to grace the stages of Broadway and London. Nominated for 12 Tony Awards, and presented in the style of the notorious “minstrel show”, this true-life story of nine African American teenagers accused and put on trial in Memphis for a crime they did not commit is one America’s most notorious episodes of injustice; inaugurating a wave of social changes leading up to the modern Civil Rights Movement. 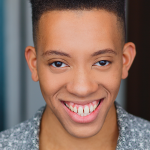 STEPHEN ALLEN (Clarence Norris) is very excited to return to Porchlight Music Theatre after playing “Benny” in the successful run of In The Heights and as a featured performer in Porchlight’s New Faces Sing Broadway 1985. He has been performing in theatrical productions for the past five years. Favorite roles include “Seymour” in Little Shop of Horrors, “Donkey” in Shrek The Musical and “Arthur Patterson” in Bronzeville. He has enjoyed every moment he has spent with this cast and can’t wait to share this story. 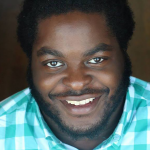 JOS N. BANKS (Charles Weems) is thrilled to be returning to Porchlight Music Theatre, where he was previously seen in last season’s Far From Heaven. He studied musical theater & costume design at Millikin University. National Tours: North American / Canadian – Hair and The Color Purple. Regional: Smokey Joe’s Café (Drury Lane Theatre); Direct from Death Row Scottsboro Boys (Raven Theatre); Hairspray (Dutch Apple Diner Theatre); The Story of Curtis Mayfield and The Other Cinderella (Black Ensemble Theatre); Smokey Joe’s Café (Theo Ubique/ Royal George). Film: Fox 20th Centuries “The Chicago Code” & Rise Against’ music video “Make It Stop” (Lead). Jos is a multi-award winning artist having interned with Micheal Kors at Teen Vogue Magazine, in NYC for his fashion designs and illustrations. Jos was also nominated best costume designer for the 2012 & 2016 Black Theater Alliance Awards. Jos would like to thank God, his family, friends and PC for their unconditional love and support. Also, many thanks to Sam, Micheal, Doug, Wardell, Flo, and Breon as well as the entire creative team for believing enough in us to tell this very prevalent story. Thank you! Be FEARLESS. Proverbs 3:5. Representation: Paonessa Talent Agency. 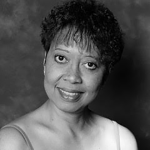 CYNTHIA CLAREY (The Lady) is happy to be making her Chicago theater debut at Porchlight Music Theatre. She has spent many years as an international opera singer, working with such notables as Peter Brook, Trevor Nunn and Sir Simon Rattle. She was seen at the Vivian Beaumont Theater on Broadway in Peter Brook’s La tragedie de Carmen. A frequent singer at Monday Night Live at Petterino’s with Denise McGowan and Beckie Menzie and at Davenport’s Piano Bar, Cynthia has also performed at The Skokie Theater, Victory Gardens Theater, Park West with the Chicago Cabaret Professionals and she just performed her own show, What Becomes of the Broken Hearted at Davenport’s Cabaret. 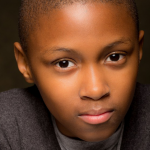 CAMERON GOODE (Eugene Williams) is 14 years old and has entertained audiences across the Chicagoland area. Credits include: Oliver! (Drury Lane Theatre); Rudolph the Red-Nosed Reindeer the Musical at the Broadway Playhouse (Emerald City & First Stage); On Golden Pond and A Christmas Story (Theatre at the Center) and Nambi E. Kelley’s Jabari Dreams of Freedom (Chicago Children’s Theatre). Special thanks to my mom, dad, little brother, Kenneth and my vocal coach, Ms. Denine Webb for always being there for him. He is gracious and appreciative of the opportunity to be a part of the historic story of The Scottsboro Boys. Thank you Porchlight Music Theatre. 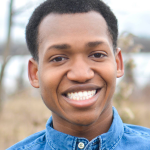 IZAIAH HARRIS (Willie Roberson) is making his Porchlight Music Theatre debut! He has been a tap dancer, jazz singer and musical theater performer since the age of 5, tapping at Studio One Dance Theater. He attended Chicago High School for the Arts with a musical theater focus and has worked with businesses such as After School Matters, Gallery 37, Congo Square, Merit School of Music, DWMP and FloFIYAH LLC. Past credits include: “Seaweed” in Hairspray!, “Robert” in The Drowsy Chaperone, “Freddy Rodriguez” in Working, “Bobby” in Urinetown and “Mark” in A Chorus Line. He is currently a sophomore at Columbia College majoring in Musical Theater. MARK J.P. 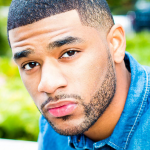 HOOD* (Mr. Tambo) is an actor and recording artist hailing from the south side of Chicago. Most recently seen as a #TeamPharrell finalist on the hit tv show “THE VOICE” on NBC! He is an ensemble member of the Black Ensemble Theater, having been in many shows including The Other Cinderella, The Curtis Mayfield Story, One Hit Wonders, Sounds So Sweet, Howlin’ Wolf and more! Some favorite theater credits include Sister Act (Marriott Theater) A Nativity Story (Congo Square) Hoodoo Love (The Collective Theater) Central Avenue Breakdown (FWD Theater). His TV credits include Chicago Fire (NBC) and playing Derek on Sirens (USA), along with a host of commercials and feature film Signature Move coming in 2017! He has shared the stage and traveled the world as a supporting vocalist to Kirk Franklin, Kelly Rowland, Jeremiah and Case just to name a few. 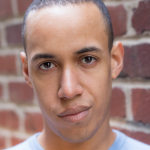 MAURICE RANDLE (Andy Wright) is thrilled to be making his Porchlight Music Theatre debut with The Scottsboro Boys. He made his professional debut at the Paramount Theatre in Disney’s The Little Mermaid as part of the ensemble. Maurice would like to thank his friends, family and the creative team on this wonderful production for all their support. 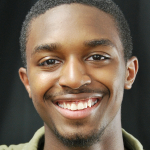 JEROME RILEY, JR. (Roy Wright) is making his Porchlight Music Theatre debut! He is a queer artist originally from St. Louis, where he found his passion for… thrifting! 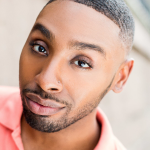 He is a recent graduate of CCC, where he received his BFA in Musical Theatre with a minor in Women & Gender Studies. Jerome was recently seen in Emerald City’s production of Junie B. Jones, & Jingle Bells, Batman Smells. He is also a part of a queer performance group: The Chanel’s, who can be seen every second Wednesday of the month at DURO, at the Berlin Night Club. He is elated to be a part of the Chicago Premier of The Scottsboro Boys! 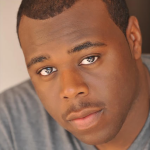 TREQUON TATE (Ozie Powell) is thrilled to be returning to Porchlight Music Theatre. He was last seen in PMT’s hit production of Dreamgirls! Trequon holds a BFA from the University of Southern Mississippi. 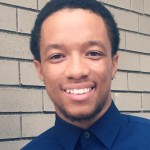 He is proud alumni of the Emerging Professional Acting Residency program at Milwaukee Repertory Theater. 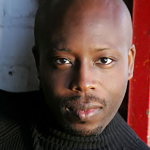 His Chicago theater credits include works with Victory Gardens Theater, Chicago Opera Theater, Black Ensemble Theater, Congo Square Theatre Company, American Blues Theater, Emerald City Theatre, The Broadway Playhouse and Definition Theatre Company. 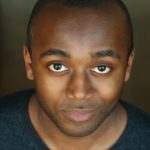 Regionally, he has worked with Clarence Brown Theatre, The Fireside Theatre, Hope Summer Repertory Theatre and Milwaukee Repertory Theater. Thank you to Porchlight Music Theatre for the opportunity to tell a remarkably relevant story and my family for their unwavering love and support. 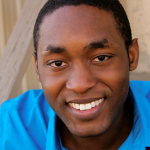 DENZEL TSOPNANG (Mr. Bones) is thrilled to be working on his first production with Porchlight Music Theatre! He holds a BFA in Musical Theatre from Millikin University. 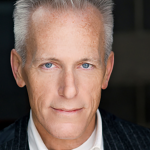 Some of his other Chicago credits include: Annie Warbucks (Theatre at the Center); Smokey Joe’s Cafe (Drury Lane Oakbrook); Velveteen Rabbit (Marriott Theatre); Heathers: The Musical (Kokandy Productions); Northanger Abbey (Lifeline Theatre); Balm in Gilead (Griffin Theatre); South Pacific & Guys and Dolls (Light Opera Works), The Healer (Pegasus Theatre). Much love to the Millifam, the famfam, and, of course, Gray Talent! TRAVIS AUSTIN WRIGHT (Olen Montgomery) is SUPER excited to return to Porchlight Music Theatre after the hugely successful run of In The Heights. He is a proud graduate of The Second City Music Conservatory and a huge fan of Spiderman. Past credits include: Porchlight’s New Faces Sing Broadway 1949 and the Jeff-nominated production of The Producers at Mercury Theatre, plus works BoHo Theatre, Refuge Theatre, Underscore Theatre, Pride Films & Plays and Light Opera Works. LARRY YANDO* (The Interlocutor) is making his Porchlight Music Theatre debut. Having just come from the Goodman, where he previously appeared as “Ebenezer Scrooge” in eight productions of A Christmas Carol his other Goodman credits include: The Little Foxes, The Jungle Book and Candide (Jeff Award). Other Chicago credits include Titus Andronicus (Defiant Theatre); The Tempest, King Lear, Julius Caesar, The Two Noble Kinsmen, Cymbeline, Timon of Athens, All’s Well That Ends Well, Henry IV Parts I and II, Antony and Cleopatra and The Two Gentlemen of Verona (Chicago Shakespeare Theater); Angels in America (Jeff Award), Travesties, An Ideal Husband, Ghosts, Electra, Measure for Measure, The Importance of Being Earnest and Travels with My Aunt (Court Theatre); Fake and Mother Courage and Her Children (Steppenwolf Theatre Company); The Dance of Death (Jeff Award), Bach at Leipzig, As You Like It, Hamlet, Nixon’s Nixon and Rocket to the Moon (Writers Theatre); Kiss of the Spider Woman (Pegasus Players, Jeff Award) and I Hate Hamlet, Jacques Brel is Alive and Well and Living in Paris (Royal George Theatre). Regional credits include: Angels in America, Arcadia and Amadeus at Milwaukee Repertory Theater. He performed as “Scar” in the national tour of The Lion King for three years. He was honored as Chicago magazine’s Best Actor in Chicago, received DePaul University’s Excellence in the Arts Award, and was the recipient of the 2014 Sarah Siddons Award for Chicago’s Leading Man. He has taught advanced acting classes at the Theatre School at DePaul University, Northwestern University, Columbia College Chicago and Chicago Shakespeare Theater’s Classical Training Program. In 2010, he was one of nine actors chosen for the Lunt-Fontanne Fellowship Program, an acclaimed program serving regional theater actors and the future of American theater. SUSAN P. ANDERSON (u/s The Lady) is delighted to join Porchlight Music Theatre in sharing this powerful story. Most recently she appeared in Artists Ensemble’s production of Vanya & Sonia & Masha & Spike where she also performed in Crumbs from the Table of Joy. Other Chicago credits include work with Goodman Theatre, Northlight, Bailiwick Rep and Chicago Dramatists. JARED GRANT (u/s Mr. Bones & Clarence) hails from Rochester, NY and is ecstatic to be joining the Porchlight Music Theatre team again! 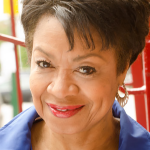 Porchlight credits include: Dreamgirls, Porchlight Revisits The Rink and New Faces Sing Broadway 1985. Other Chicago credits include: Nine Lives: The Musical (Chicago Musical Theatre Festival) and Mr. Burns, A Post Electric Play (Theatre Wit). A graduate in Musical Theatre from Columbia College, favorite credits include: “Tom Collins” in Rent, “Adult Men” in Spring Awakening, “Lee Collins” in Floyd Collins and “Uncle Peck” in How I Learned to Drive. He thanks his family and friends for keeping him in check and for Stan Lee & Bob Kane for creating some of his favorite characters in the world! 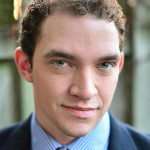 MICHAEL LOVETTE (u/s Ozie & Andy) is excited to make his Porchlight Music Theatre debut with The Scottsboro Boys. Originally from Lawton, Oklahoma, recent roles include, “Jason” in Bare: A Pop Opera;“Angel” in RENT and “Melchior” in Spring Awakening. He would like to thank his family and friends for their love and support and the casting team at Porchlight Music Theatre for giving him this opportunity. PATRICK PERRY (u/s The Interlocutor) is proud to support his fellow actors in his first Porchlight Music Theatre production. He was recently seen in My Fair Lady with Light Opera Works. Other credits include: South Pacific (Light Opera Works) and Spamalot (JPAC). Porchlight recently announced that next season it will move to the Ruth Page Center for the Arts at 1016 N. Dearborn, putting its shows within easy reach of the downtown tourist crowd, and providing greater seating capacity for its expanding Chicago audience. “The Scottsboro Boys” is a perfect example of why it is bound to thrive. 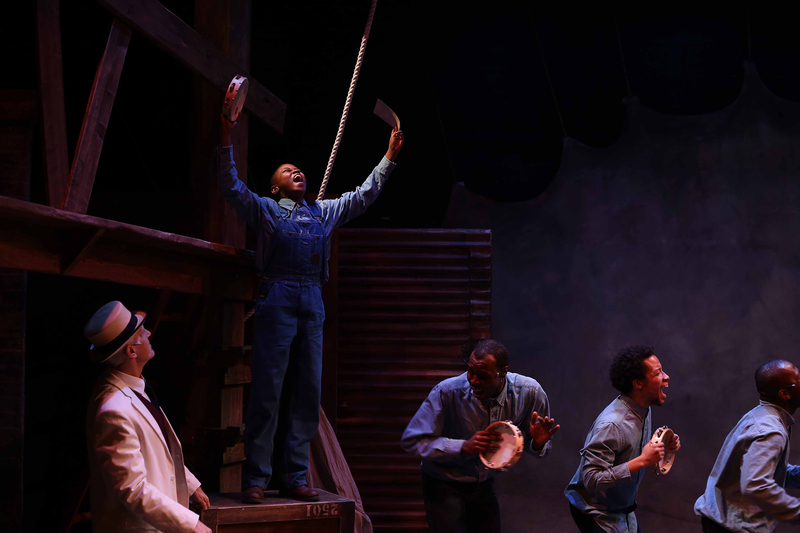 “The Scottsboro Boys,’ while a musical, is poignant, thought-provoking and will indeed give you pause if not make you feel a bit uncomfortable about our history. And that’s a good thing. You will leave wanting to know more and you will owe it to yourself to learn more so that we can continue to grow beyond our prejudices. That’s unusual for a musical to accomplish, but then, Kander and Ebb’s final work together is an unusual and important piece of theatre, not to be missed. A masterwork…stacked with young talent and surely the product of enormously passionate and heartfelt endeavor…”Scottsboro” contains what might be the most beautiful song (Kander and Ebb) wrote — “Go Back Home,” a mournful ballad of longing enough to bring to tears anyone who ever has been away and in trouble. Brilliant… The cast of players, however, is why this production shines as bright as it does. I suggest that anyone over the age of 13 get to see this historical tale of prejudice, to learn about the past and of greater import, to make certain that such an event can never take place again. This is a solid production of a solid show with material that will open your eyes, your mind and of course, your heart! Porchlight’s uproarious and enchanting Chicago premiere of this Tony-nominated one-act is unimprovably played by a superb 16-member cast and six terrific musicians. It’s shaped to picture-perfect, emotion-accurate glory by stage director Samuel G. Robertson and raised to musical triumph by Doug Peck. But it never forgets the crime it chronicles. Richly melodic, enticingly rhapsodic, exuberantly danced (thanks to wizard choreographer Florence Walker-Harris), gorgeous in their harmonies and infectious in their rhythms, “Make Friends with the Truth” and “Never Too Late” are non-negotiably enthralling. No ensemble could enjoy more rapport. 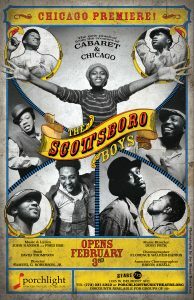 Kudos to Michael Weber for having the vision to mount “The Scottsboro Boys” – The Musical in its Chicago Premiere and for assembling such a outstanding crew of creative talents to make Porchlight’s production so stunningly powerful. The tasteful sensitivity and the stage craft that director Samuel G. Roberson, Jr. and his staff brought to the material? 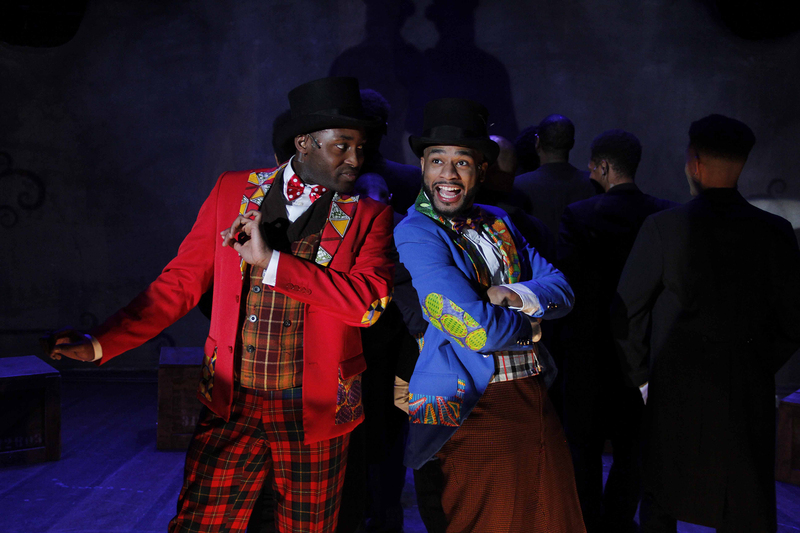 Once you see The Scottsboro Boys – The Musical, you’ll realize that it plays as one of the “greatest” (I seldom use that term but it fits here!) musicals mounted on a Chicago stage. In my 16+ years and almost 4,500 shows reviewed, this is one of my cherished nights at the theatre. This work is both visionary and controversial but it is tasteful and empathetic. Each of these ‘boys’ were nicely developed throughout with James Earl Jones, Jr (doing his finest work yet seen in Chicago) as the boy’s leader in defiance and as a smooth singer of the haunting song “Makes Friends With the Truth” as he refused to plead guilty for something he didn’t do. Jones led the talented dancers/actors. 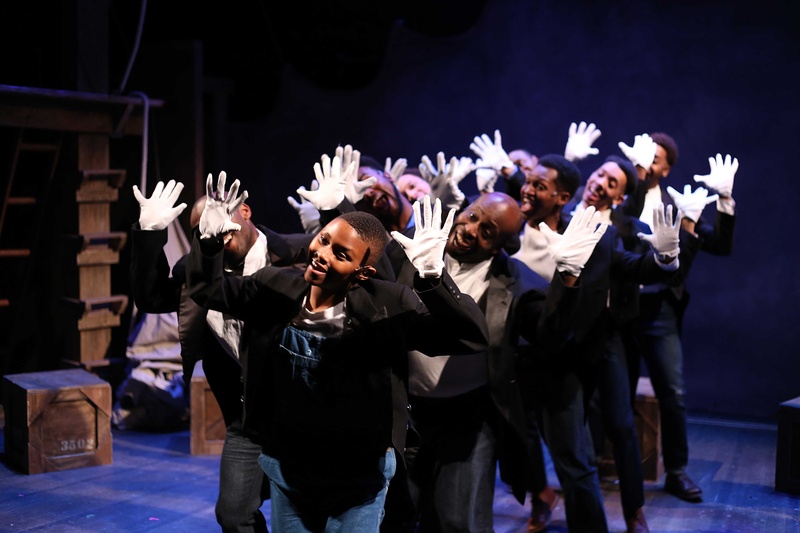 The Scottsboro Boys” – The Musical works as fine story telling; as a fine song and dance piece and as fine tribute to the strength of the human spirit as exhibited by the nine brave boys. This show is a masterpiece. It is the finest musical I’ve ever seen by Porchlight! I was enthralled with Director Samuel G. Roberson, Jr.’s vision. He rolled the train onto the stage and his talented ensemble climbed out. Always a musical powerhouse, Jones leads the soulful unrest. His solo “Nothin’” has an echoing ache not easily forgotten. 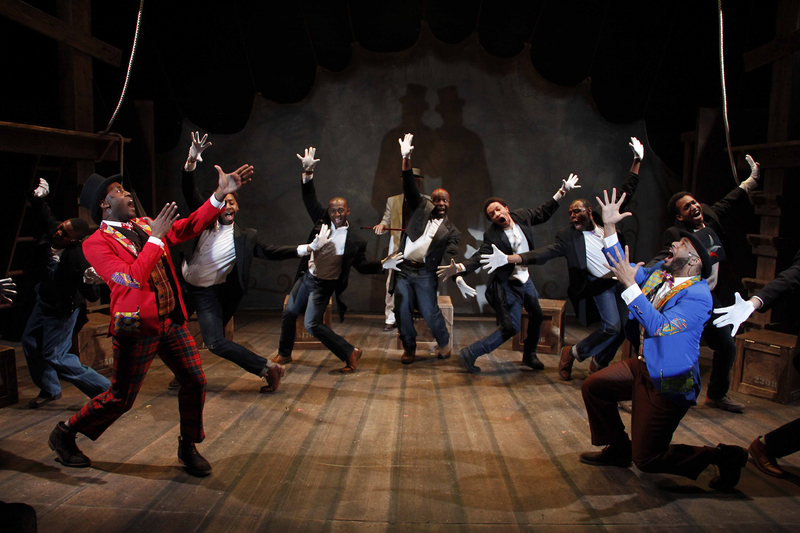 “The Scottsboro Boys” is an act of reclamation. Of all the excellent voices, heard frequently in solo and in harmony, James Earl Jones II’s has the polish of Broadway. Stephen Allen Jr. (returning to Porchlight after his turn as Benny in “In The Heights”) and the young Cameron Goode bring all the glory of a Sunday morning with voices that stretch to the heavens before tumbling down gracefully to the reality of the god-fearing South. The impact of “The Scottsboro Boys” lands like a heavy thud against the locked doors of oppression. 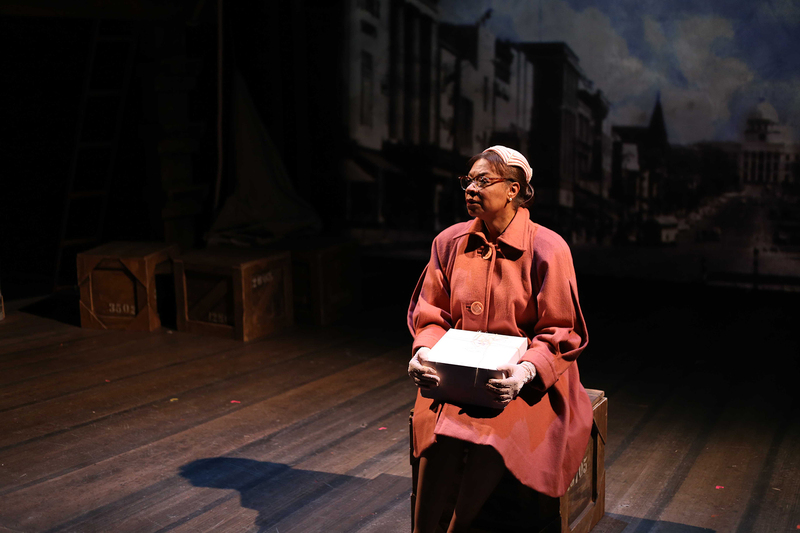 Porchlight Music Theatre’s Chicago premiere features a superb ensemble under the direction of Samuel G. Roberson Jr., with period-style choreography by Florence Walker-Harris and Breon Arzell and first-rate musical direction by Doug Peck. This recipient of 12 Tony Award nominations is, as reported, a significant work—detailing with clarity and emotion the societal outrage and human catastrophe this case represented. It’s enough to have one more vintage song from the creators of so many great musicals. Porchlight has hired a perfect cast and creative team to rise to the challenges of this piece. Patterson is played and sung magnificently here by James Earl Jones II. Jones absolutely kills with the beautiful “Go Back Home,” as well as the comic “Make Friends with the Truth” and the anthemic “You Can’t Do Me.” The remaining eight are no slouches, but other than Jos N. Banks (who gets to double, impressively, as accuser Victoria Price), they don’t get a lot of individual time. 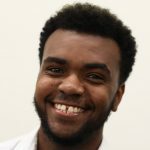 They all make an impressive ensemble, though, being kept busy by the high-stepping and distinctive choreography by Florence Walker-Harris and associate choreographer Breon Arzell. There’s an impressive step choreography number for a chain gang scene that I presume is mainly Arzell’s contribution, given that he won a Jeff award last year for the step dancing in Oracle Theatre’s production of The Hairy Ape. Something wonderful. A heartfelt moment, an incident that angers, or a classic song in the distinctive voices of Kander and Ebb…and is performed here with consummate professionalism. Excellent performances and several cutting images, alongside a real-life miscarriage of justice that speaks to contemporary problems in the justice system. Jones as Haywood shines as the voice of righteous fury in “The Scottsboro Boys.” His early testimony number, “Nothin’,” provides both the requisite politeness required of him in court, but is performed with enough of a sneer that the audience is in on the injustice. Heywood Patterson is the most prominent Scottsboro boy. His story how the supposed justice system failed him. James Earl Jones II plays Patterson with such gumption it feels like he is putting every ounce of fight within him into his character. The rest of the cast also has their shining moments. They can harmonize and blend like none other.. Mark J.P. Hood as Mr Tambo almost steals the show with his over-the-top comedic styling and ability to seamlessly shift and change into multiple characters. This story is one that should be told. This is the world we are living in today— a world in which people still have to worry how the color of their skin will determine how they are treated. 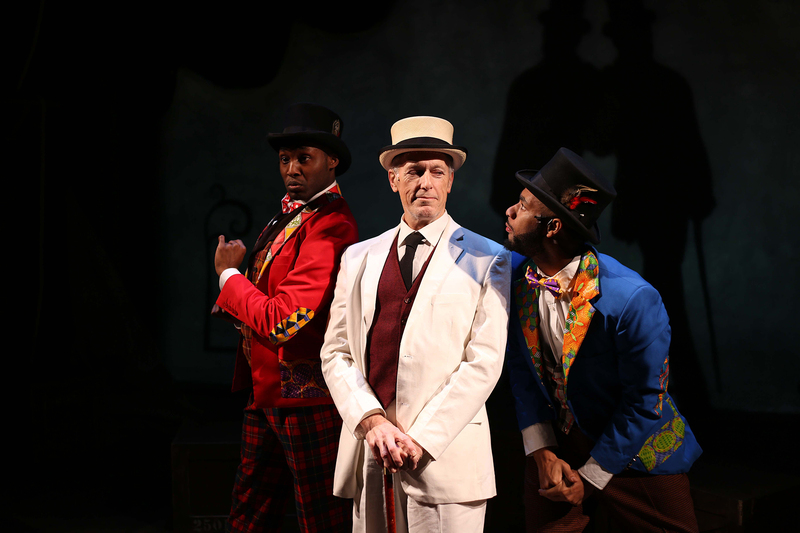 “The Scottsboro Boys” highlights everything that is still wrong about racial justice today. The fight is not over. One day the truth will hopefully prevail.